The young man walking across America was not alone. Since last Tuesday, Rev. 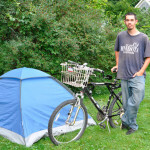 Jim Peterson has been hosting Chris Wood, a 20-year-old, who has been riding his bicycle from Minnesota to Maine. 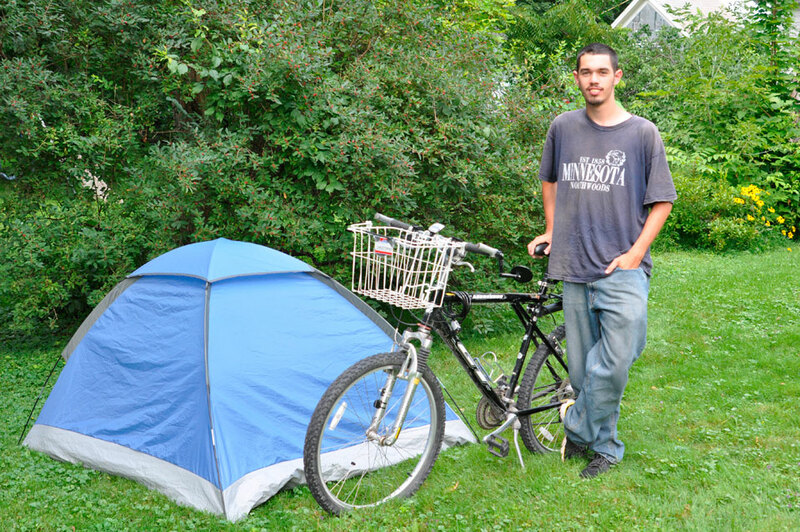 When Wood tried pitching his tent on what turned out to be private property in Middle Granville, he was directed to Peterson, who was happy to take him in. Since then Wood has been sleeping in a tent in the Peterson’s backyard, playing computer games with their foster son, helping out around the house and yard and helping prepare decorations for the upcoming Vacation Bible School. Wood has been averaging 50 to 80 miles per day and is on his way enroll in a Job Corp program that will teach him to be a computer technician. Though he was resting his legs for a few days in Granville, he was expecting to be on the road again during the weekend. “Like the young man walking from Maine to California, Chris has found most people very friendly and kind,” Peterson said. Those interested in checking out Wood’s pictures and tracking his progress can find him on Facebook.